Yes, like I stated above the picture. 18x9.5 +45, which is the rx8 nice conservative setup. I'm still waiting on my hardware. Hoped it was going to show up for my bday but it didn't. Soon as it gets here I'll have another pic session. Ah I just overlooked the text so close to the pictures. 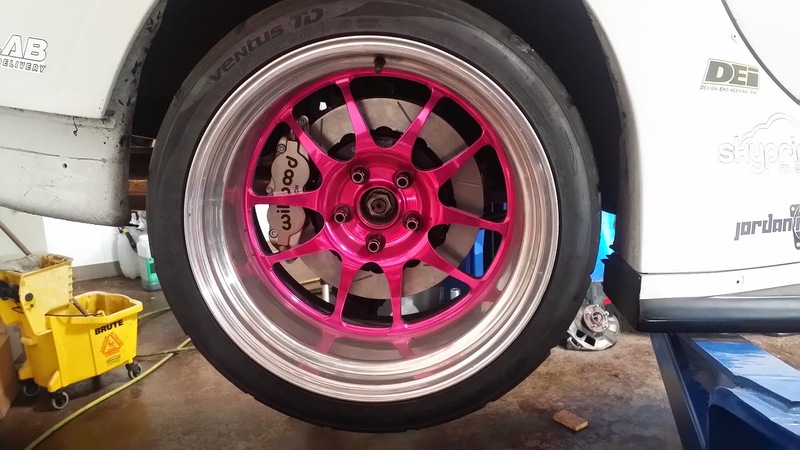 Get a chance to get the rears done? would like to see fitment on the rears. This set of rear wheels has no pad an a flat face, needed a 5mm spacer to clear. My math says the caliper sticks out ~0.650" forward of the rotor mounting surface. No mechanical ebrake bracket yet, need to finish this round of work here before I can take a couple afternoons and get it measured and drawn. So there's almost no possibility of a 17" working over the front calipers/kit? are there any updates/reviews on the BBK’s? Is there a caliper fitment template? As I’m interested in the BBK’s and looking forward to any news. I could design an new bracket for a 13" rotor that would possibly fit inside 17's, but you still have the issue of the 'ears' of the Aero6 caliper being too wide. We do have a Forged Superlite option for the fronts with a 6-piston front that'll fit in most 17's, but we'd have to change rear piston size to match the smaller pistons in the Superlite fronts - doable! Shoot me a message and I'll try and track down pricing. We've been busy! 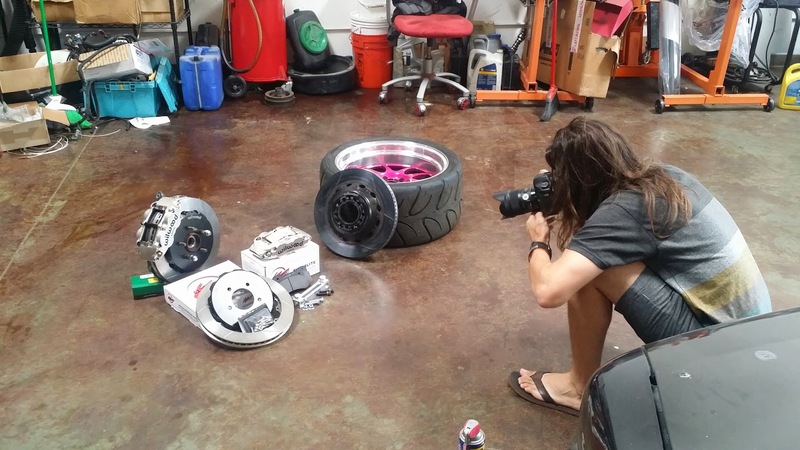 I am in the process of uploading our recent PASMag feature on the brakes and will link it here, and we've got a couple guys who've installed the brakes and hit the track. The only issue we've had is with fitment on a car that had brake duct plates installed between the spindle and the hub, effectively spacing the rotor away from the hub by .090" - the bracket wouldn't align and we couldn't figure out why until I actually got there and measured everything. Everyone else has reported the same fitment I have here on my car. 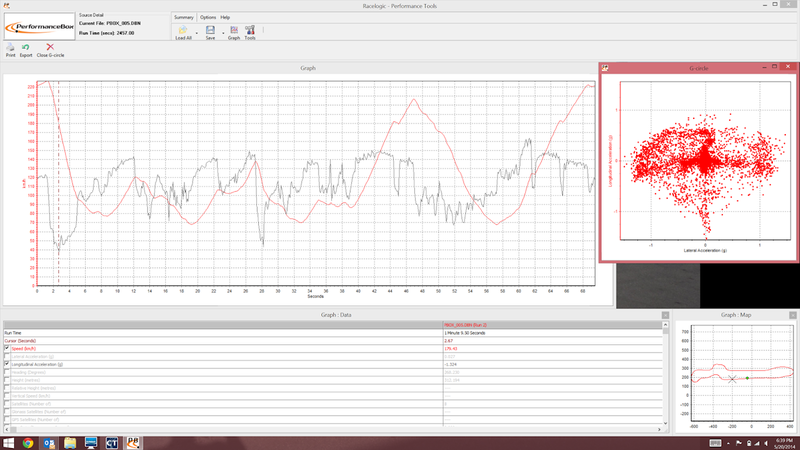 As far as a caliper template, I don't have the side of the caliper in CAD, but can eventually measure that out. The introductory pricing period has ended and we've re-evaluated what our actual costs have been on these first 5 or 6 sets... I knew it would be an 'aggressive' deal for these first few, but it got pretty brutal with additional production costs and Wilwood's unpredictable shipping costs. I'll have updated pricing available soon. I saw your feature flipping through a PASMAG magazine, well done. I got them, just bedded them today. So far I love them, they look hot and stop good. After driving my Rx7 around today my Subaru seems like it has no brakes at all. I highly recommend these brakes, this is the best kit you can get for your RX7 today. Who bought these.... installed them.... and has some feedback from using them on the track? Not street use which says nothing about their potential? Any install issues with them? Other feedback? Also mention how the parking brake works if you have it. You mean... aside from me? Haha yeah there's at least 3 out of the 10 or so sets that I know have been beating up dudes at the track. I believe I posted the Vbox screenshot from a 1:09.5 lap at Auto Club (Infield) with 1.5g+ lat and 1.4g braking, on "street tires" / VentusTD's. We've seen 1.6g braking at Buttonwillow but I don't have the log, that was before I bought my own Vbox. I saw 2+secs off WSIR with the installation of the brakes, but we also changed to the OS Giken diff since the first time there - same suspension and alignment settings though, same set of tires. I haven't tested any other BBK's as a comparison, so one of the customers that upgraded from a lesser kit can chime in for that. Parking brake has taken forever and a day to bring along, but should be getting my first brackets back shortly and hopefully the caliper the company sends matches their drawing. Jeff, do you think your parking brake solution will work with my Stoptech rear kit?